Newly-released data from comScore supports what may be an intuitive point about e-commerce purchases: mobile purchases tend to be higher for relatively cheap and low consideration products such as video games, movies, and digital content, and lower for more expensive categories such as computer hardware. 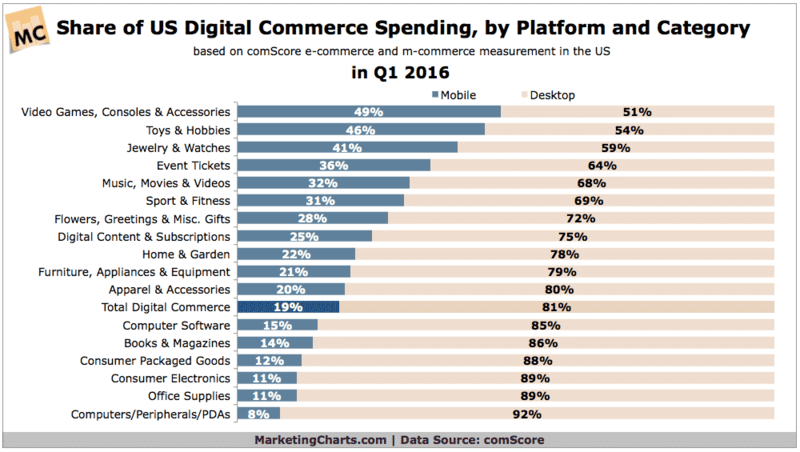 Interestingly, the data shows that the categories with the highest mobile share of purchases are also the ones with the most rapid e-commerce growth.The analysts suggest that “mobile may be enabling the purchase of products that were previously less likely to be purchased online altogether,” noting that eliminating the friction of buying on mobile (smaller screens, privacy concerns, etc.) is critical for retailers.